Jules Baud was approached by mineral hunters mining for crystals who needed protective eyewear to explore the Chamonix Valley. Julbo® Eyewear was born. Innovative mountaineering features were integrated by Baud to aid the expedition with modern technology, incorporating side shields, an ergonomic horseshoe shape, and lenses crafted from tinted materials. My only gripe about this item is the size. It says 6-8 years old and I ordered a pair for my 6 year old and a pair for my 4 year old. Unfortunately, I have to return both pairs because they are so small. My 4 year old is big for her age but my 6 year old is average. I think these are better suited for the younger/smaller end of the 3-5 year old range. Otherwise, style was great. The glasses were soft and flexible which is great for kids. My autistic toddler wore these no problem- very comfortable for him. Not the most trendy looking glasses but they do the job! These are very high quality sunglasses for kids! A little small for my 4 year old, this is cute glasses. My little girl love it!!!. I love these kids glasses because are great sun protection. Highly recommend these glasses. The Sunglasses fit well to my little daughter. The size is perfect. She loves them. I recommend this product. I'm so glad that I found this style for my 10-months-old grandson. It doesn't matter which way you put it on, which is a wonderful feature in sunglasses for an infant! It's obvious that he's more comfortable on a sunny day when he's wearing them. He seems perfectly comfortable in them, with the strap or without. I have already recommended these sunglasses to others. This item is mislabeled as appropriate for 2-4 years old. The packaging of these glasses read from 12-24 months old - it is way to small for the 2-4 year range - be advised. The grey was much lighter than appears online. We will see if they stay clean. My daughter wore these glasses up until she was 2 years old. I loved them for these reasons; great eye protection, has a reversible frame which means she can put them on right side up or upside down and they still fit, elastic strap, curved temples so they fit well, the frame is resilient and they are stylish. These glasses offer excellent UV protection. Nice glasses. Well made. I found another Julbo model that fits my 4 year old a little better than these, but I would recommend them! Weird fit! These were way too small for my 2.5 year old. Maybe she has a big head? A little too small for my 2.5 year old, but cute glasses. I would say 1-2 years might be the ideal age for these. Nice glasses! I bought a few different Julbo glasses to try on my 2.5 year old and this pair was the best fit. They are still slightly big for her to use without a back strap, but with one, it is a good fit. The glasses stay against her eyes. Well made and very cute! Bought these for my 3 year old for trip to Disney. She loves them. Look great and are well made. Fit her face well. Much better than the cheap glasses you see for kids in the store. 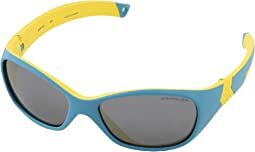 Great sunglasses for boys aged 4-6. It has great coverage, excellent sun protection and uses flexible, soft materials for amazing comfort. Great colors for little boys. The lenses are 100% UV protected and the flash finish on the lens make them extra stylish. They work well. My daughter wasn't pumped about putting them on but once they were on and we were outside, she wasn't complaining. My daughter loves these sunshades. They fit her perfect! Julbo sunglasses for kids are almost indestructible. We purchased a Looping pair for our son when he was a toddler, and while it took a beating (and a few bite marks) it is still usable for our youngest. Now that our oldest is ready for a new pair we've graduated to the Solan for kids. This one has hinges that could possibly be overstretched but we've never had that problem, plus our kiddo is much better about taking care of personal items. The wraparound style is great and fit our 4.5 year old boy perfectly. Love the removable option for a neck cord. Eye protection is so important for children and I'm willing to pay a bit more for a quality pair of sunglasses that will last while providing excellent sun protection for my kids. My daughter has grown up wearing Julbo glasses starting with the Loopings. She is now wearing the Reach L - perfect for 10-15 year olds. The Reach L are both stylish and functional and they have a great fit thanks to the wrap around style and curved temples. These glasses come in great frame colors and lens colors for both boys and girls. Highly recommend these glasses for tweens! I bought these glasses for my 9 year old daughter for a trip to Mexico! They were awesome because they look stylish, they have a nice dark lens which are 100% UV protective. The color was perfect too - just the right amount of pink. I give them a two thumbs way up! I have used the looping series for my daughter as she has grown up. She started wearing the looping 1 all the way through the looping 111. These were great when she turned 3 years old and she wore them for over a year. 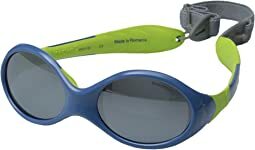 I love these kids glasses because they are indestructible, great sun protection with spectron 4 lenses, an elastic strap so they won't come off during activities, the frame is reversible so the child can put the glasses on any which way, and the colors are awesome. Highly recommend these glasses for summertime or during sunny snow days. Bought these for my Granddaughter's BD and she loves them. She goes out on their boat at least every week, and needs good UV sunglasses. These are pretty and fit her needs. Great sunglasses. I bought these for my 3 year old. He used them at the beach, running in and out of waves, building sand castles, and general 3 year old running around craziness - the sunglasses never fell off once. He did have to adjust them occasionally, simply by pushing them back when they slid slightly down his nose. The glasses are flexible and have withstood some bending and flexing without any issues. These are a great quality product and worth the price, as you would probably go through several pairs of a cheaper product. Super cute glasses for my son, unfortunately, they are too tight. They say these are for ages 8 to 12, however, they are for smaller children. I purchased these as a gift. However, my choice of this item had to do with the fact that they are cute, there is no upside down, and they can be secured to the head so they won't fly off. They were described as spot on so I am happy with the purchase.